Podere di Pillore for sale. Buy online at Zingerman's Mail Order. Gourmet Gifts. Food Gifts. An organic bombshell from Tuscany. A Tuscan extra virgin olive oil treat that found its way to us courtesy of friend and food writer Faith Willinger, whose legendary palate has steered us toward a number of excellent food finds. I visited Alberto Passigli a few years ago, and the memory is still with me. He's a passionate, spirited man who, in true renaissance fashion, is in his third career—after horse riding and symphonic cello. His 500-year-old farmhouse sits among his olive groves in the hills above Florence near Fiesole. 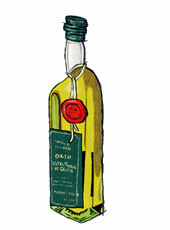 Alberto gets the big picture and the details of olive-oil making right. The olive groves are on well-drained slopes and pruned vigorously by his foreman who's been tending the trees for over five decades. Made entirely from Alberto's own organic olives, the oil is stored in a series of traditional, antique terra cotta vessels (some over 100 years old). It's hand bottled to order with labels printed at the venerable Florentine shop of Pineider, the source for Dickens' stationery. Podere di Pillore's quantities are quite limited at fewer than 2,000 bottles a year.